Every year, there is a group of us that has been making a trip to Kona, Hawaii to dive like there’s no tomorrow. For those who make the trip, it’s become the event of the year. It’s a lot of fun because we just go. 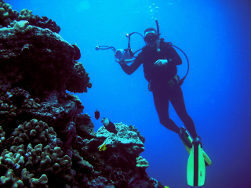 We’re not on a formal tour, and Kona scuba diving is awesome! In the past, we’ve been diving with dolphins, pilot whales, sharks, manta rays, eagle rays, turtles and countless other critters. If you are interested in joining us, please email me at: joe@joescuba.com, and I’ll keep you in the loop. Divers of all skill levels are welcome, but you need to be self-sufficient. Many of us are Divemasters and Instructors, and we are more than happy to help you make safe and enjoyable dives. But, keep in mind we are on vacation, so if you need people to carry your gear and monitor your air, you might want to hire a local guide to be your dive buddy. 2016 Update: The dates for the 2016 Kona Dive Trip are March 5th through March 13th. We’ll do 2-3 dives per day. Divers of all skill levels are welcome, but a few of our entries require a bit of a walk over lava rock. There’s also the occasional surface swim. In general, I’d say most of the dives are intermediate, with one or two easy dives, and a couple that are pretty advanced. Kona Shore Diving 2016 from Joe Ross on Vimeo.